On the way back from our laid-back trip a few weeks ago, Hubby and I decided to venture through part of the John Day Fossil Beds National Monument in Oregon. Maintained by the National Park Service, there are three units that make up the John Day Fossil B eds: Clarno, Painted Hills and Sheep Rock. In the Sheep Rock Unit you’ll not only find great places to hike on trails and take in unbelievable views, you’ll also discover the Thomas condon Paleontology Center and The James Cant Ranch. Many people don’t know that most of Oregon was once like a tropical rain forest. 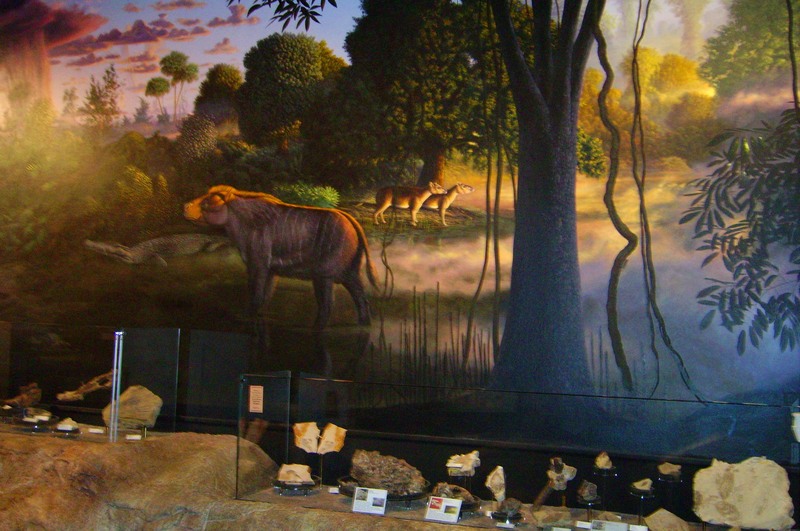 The Paleontology Center takes visitors through 40 million years of history through a collection of fossil specimens and large murals. 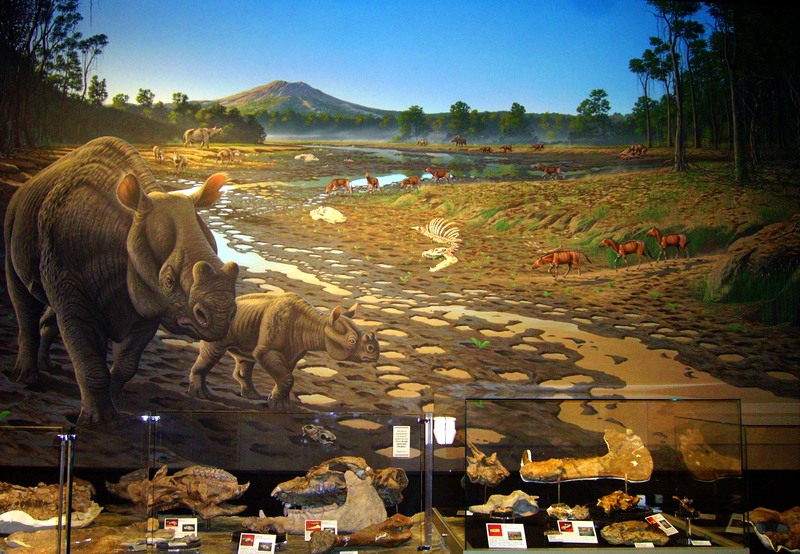 What a rhino may have looked like millions of years ago. 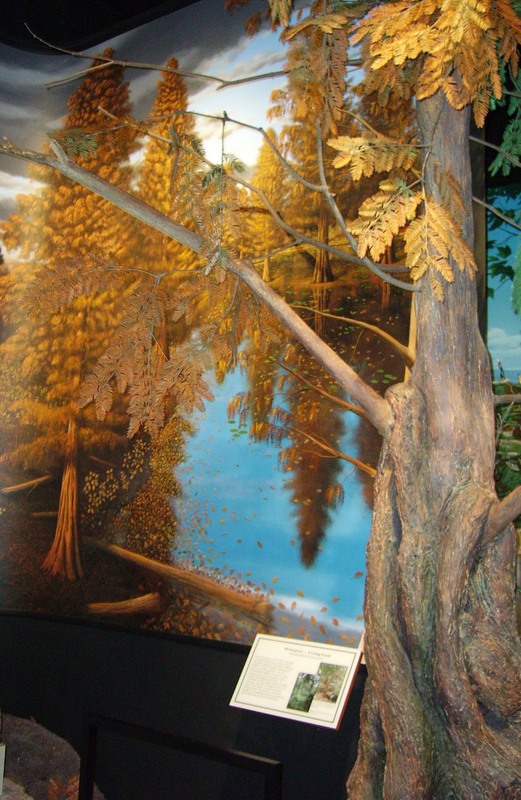 Informative displays throughout the center provide insight into the history and evolution of Oregon. Some displays had frightening looking prehistoric animals. Like this tiger and the sweet little deer. I thought the deer would have made a great pet. Maybe even a great replacement for our Heinous Cat. Some displays showed a bit of humor. A prehistoric gopher - would not want to have him digging in my backyard. When we finished up at the Paleontology Center we drove about a quarter-mile up the road to The James Cant Ranch. Scottish immigrants James and Elizabeth Cant bought the land in the early 1900s and operated the ranch in the dry hills of Oregon until the National Park Service purchased it in the 1970s. The 1917 Ranch House has been renovated to house the park headquarters and a museum telling the story of the people who inhabited the area, starting with the American Indians up through the sheep and cattle ranchers. Visitors are allowed to tour the house and the grounds. Signs cautioning visitors to leave the rattlesnakes alone kept us from getting to adventurous in our exploring, but the ranch was fun to see. The grounds at The Cant Ranch are very well maintained. The Cant Ranch Corrals with painted hills in the background. Elizabeth Cant spent a large portion of her life in the kitchen, cooking and cleaning. It appeared that she was well-known for her good cooking. The museum even had a recipe of hers to share, so here it is. I haven’t made it yet, but it sound really yummy. Dissolve cocoa powder in 5-6 tablespoons of hot water. Mix together sugar, Crisco and beaten egg yolks. Add cocoa mixture. Stir in milk then beat in flour. In a separate bowl, beat egg whites with baking powder and a dash of vanilla. Add to batter and mix well. Here is where the directions end. So I’m guessing you would pour this into a prepared cake pan and bake at 350 degrees until done. If anyone gets ambitious and makes this cake, please let me know how it turns out!